Doctor. I just dropped in to tell you how much I benefited from your treatment. Doctor: But you're not one of my patients. Stranger: I know. But my Uncle Bill was, and I'm his heir. I'm Edward Hick. 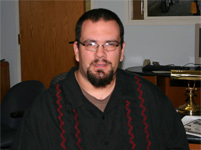 I am the junior Graphic Designer at GWRRA and one of the newest Members of the GWRRA team. My job is to assist with the development of the graphics for Wing World magazine. It is my pleasure to do what I can to keep Wing World a visually pleasing magazine to read. My wife and I are from Arizona where we currently live. Together we are raising our three children. Other than my family, my other passion in life is my work as a Digital Artist and Graphic Designer. Along with my work at GWRRA, I do a good deal of personal projects and I have donated my services to several local charities. I wish you all safe travels wherever the roads take you this riding season. THANK TO ALL OUR HEROES! This notice was sent to me by Ralph & Darlene Jose, Chapter D-Fargo, ND. Our GWRRA family wishes the guys well and thanks them and all our heros for their service! ND Districtor's (Paul & Kay Metcalf) sons all going off to the Middle East next week*. Nice article and we thought you'd be interested. VALLEY CITY, N.D. - Families and friends will be gathering in rural Valley City this weekend to say goodbye to three brothers who are deploying soon to the Middle East. The three - Ryan, Cory and Jason - are the sons of Paul and Kay Metcalf. This is a tight family. The three boys are always available to help their dad on the farm. "It will be different next spring, trying to seed everything by yourself," Paul said. Ryan and Cory have been deployed before. The youngest, Jason, has not. "A little nervous, a little scared," dad Paul said. The boys know this will be hard on their parents. "It will be hard on our mom," Jason said. There is some comfort knowing they will all be deployed together. "It will be nice to have family there so I have someone to BS with," Ryan said. Cory added: "Granted, I had friends like brothers, but it will be different having family there." "Very proud of them, and if we knew they were not in it for helping everyone, we would be fighting for not sending all three," mother Kay Metcalf said. "I am looking forward to the celebration. But after that, it is going to be tough, hard," Paul said. And the emotions? "Oh yeah, they are flowing," Paul said. The boys take after Grandpa Ralph, who always lived just a few yards away from them all these years. He was in the service for 41 years. And the Metcalfs sure picked a good spot to farm here in Barnes County. Neighbors and others nearby have said they will be there for them in the coming months. Sure, the crops will come in this fall. But it will be a much different autumn here on the Metcalf farm and fields. Three boys who called this home for so long, off at war, with so many already awaiting their return. The brothers will deploy with 160 other soldiers with the Wahpeton-based 188th of the North Dakota National Guard. Where is a Police Officer When You Need One? I read an interesting blog on the " All Things Safety Oriented Motorcycle " website recently sent in by a member with the blog initials D.R. It seems he had an opportunity while riding his motorcycle to alert a police officer to the fact that a motorist was driving and talking on a cell phone. Here is an excerpt of what he said; " On the way to work the night shift yesterday afternoon, I was driving the middle lane, doing the speed limit, when I noticed in my left mirror, a car over taking me in the left lane. When the car passed me I noticed the driver talking on her cell phone. She also, for some reason, had her left foot propped up on the left most corner on the dash. I then noticed a police officer up ahead on the shoulder of the road writing out a ticket to another motorist. I decided to alert the officer to the cell phone driving motorist by slowing down and honking my horn long enough to get his attention as I drove by. As he looked in my direction, with my left hand I quickly made a "phone call" hand signal (a fist, with thumb and pinkie extended, held up to the left side of my helmet) and then pointed to the car about 100 feet ahead of me in the left lane. About this time I passed the officer who I note has looked in the direction I pointed. In a short period of time I noticed the police cruiser approach (no lights) and move slowly beside the cell phone using driver. After a few moments the police cruiser drops back, moves in behind the driver and then engages his flashing lights. After a few seconds, both cars move to the right shoulder and proceed to stop. I did not see what transpired after that but I'm sure at least a warning was given to the driver, if not a ticket". Folks, cell phones absolutely have a place in our society now. 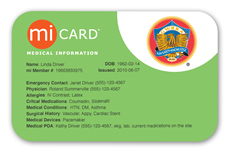 There are many instances where they can come in handy, especially in emergency situations. Using them for a time killer while driving is dangerous and unnecessary. If you must use them, pull over into a safe area first this way neither you, nor the traffic you are driving in, is at risk. Did you know that Fort Wayne, Indiana is not only home to Wing Ding 34, but also home to two great national favorites: Vera Bradley and DeBrand Chocolates? Vera Bradley is the much-beloved manufacturer of hand-quilted purses, accesories and luggage - and DeBrand creates delicious chocolates, truffles, and desserts. 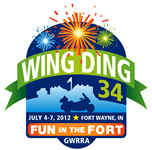 Or, visit us online at www.VisitFortWayne.com/WingDing! We'd like to give you the results of the last survey we have posted on the home page. "How often do you use computers or communications devices? (i.e. smart phones, etc.)" Road2luxe, the Honda Gold Wing 1800 rental specialist in Europe, Los Angeles and Montreal, organizes individual and group tours. They give tours in Marseille, Nice, Lyon, Paris, Barcelone, Milan, Geneve, Los Angeles and Montreal. They will also customize tours for you and your group. They also have worldwide partners, so...see their website here. On July 5th of this year, my husband Lee, and I embarked on a "Bucket List" trip from Prescott, Arizona to the Canadian Maritimes. 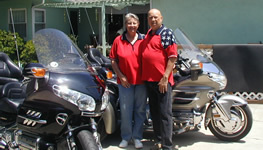 Being Members of GWRRA's Chapter Y in Prescott, we carry our Gold Book with us on our '08 Goldwing-Champion trike. We traveled on our "Candy", pulling an Ambassador camping trailer behind. We traveled through Colorado, Nebraska, South Dakota, Minnesota, Wisconsin, Michigan, and crossed over the border into Canada at Sault. Saint Marie, Ontario. As we were tooling along close to North Bay, Ontario Candy began making a noise which we knew was not her usual purring sound. It sounded serious. Deciding we needed someone to check her over, we decided to hotel it instead of trying to camp out for the night. Not being familiar with the North Bay area, Lee looked in the trusty 'Gold Book'. It gave a listing for a Honda dealer. Just to play it safe, I suggested to Lee that a call to someone on the members listing for North Bay may help us locate the dealer or another repair shop that could determine 'Candy's' problem. Being a dutiful husband, he made a couple of calls to names on the list. No one was home so he left voice messages. In less than half hour, Lee received a call from Roger Malette. He graciously offered to meet us at our hotel early the next morning and personally lead us to North Bay Cycle and Sports. He just happened to be a personal friend of the owner. Even though the shop had a two week out appointment schedule, they moved 'Candy' up to the front of the line. Roger stayed with us until they were able to discover her problem - the universal joint in the trike had begun to fail. A Tim Horton's coffee shop across the street was our waiting room and Roger would stop by every so often and give us an update on what was going on. Visiting with him, we found out he is the Chapter Director for North Bay and it is a very large Chapter indeed. He's a busy man who owns several businesses in North Bay, yet he had time to take care of us. It took a few phone calls to determine which brand and part number of U-joint needed for our particular trike. Then...was it available in North Bay? Thoughts of being delayed on our trip while waiting for a part entered our minds. Roger to the rescue! He called around and found the part, picked it up at the parts house and delivered it to North Bay Cycle for us. What a glorious day! What a great guy! Once the part was at North Bay Cycle, the guys in the shop went to work. Roger, Lee and I went across the street to Tim Hortons for lunch and to wait. While we were visiting with Roger, Denis Carr and his wife Michelle walked in looking for us. Denis was one of the names Lee had called the day before, and is Assistant Chapter Director and Membership Enhancement for North Bay. Denis knew of our situation, and just stopped by to offer their help in any way we needed - even a bedroom. We appreciated their gracious offer, but declined. After checking with the shop, the news was that the part had been replaced and they had some checking to do before 'Candy' would be ready, and since it was late in the day, they suggested first thing in the morning would be the best time to pick her up. Since we had no transportation, Roger came to the rescue again. He knew we happened to pick the most expensive hotel in town and suggested one near his home which would be better on our budget. We wanted to repay him for all he had done and asked if he and his wife would join us for dinner - on us, of course. He cleared his obligations for the evening and we agreed to meet for dinner. They arrived to pick us up at the new hotel and we were introduced to Denise, his lovely wife. We had a great time with them and Roger even took us on a tour of North Bay. The next morning Roger was at our hotel to pick us up and took us back to North Bay Cycle to pick up Candy. She was ready. After saying a grateful goodbye, we continued our Bucket List trip to the Canadian Maritimes. We had made new friends, found a great bike shop, and after traveling over 10,000 miles in almost two months, we consider that necessary stop in North Bay, Ontario, Canada and meeting such kind and generous people, a highlight of our journey - thanks to the Gold Book. 1- Was Johnny Appleseed a real person and what is his connection to Fort Wayne? 2-How many parks are within Fort Wayne's city limits? *Financial Services: Show Your GWRRA Pride! - No Annual Fee GWRRA� Visa� Credit Card Program, with Rewards Program, low introductory APR on Purchases and no balance transfer fees for 6 months.Click here to Earn bonus points for FREE airline tickets, merchandise, cash-back and more at participating merchants. Enhanced Visa� Platinum benefits, including 24/7 Emergency Customer Service and 100% Fraud Protection, Auto Rental and Travel Accident Insurance and much more. Competitive interest rates, plus 3 card designs or upload your own picture! It is time to update your Gold Book listing. Remember to make sure you have a current phone number listed on your Member listing, as well as the correct listing you wish to show in the Gold Book. (i.e., tools, phone calls, etc.) Also, remember if you select "Do not list me in the Gold Book" as one of your selections or have no codes marked, you will NOT show up in the Gold Book! GWRRA was founded in June, 1977 and next year we will be celebrating our 35th anniversary. Talk about an accomplishment, especially in the motorcycle industry! Over the next several months, I am going to be posing the question, "WHY" and then discussing the answers you present. Why has GWRRA survived and even thrived at times and waned at times over these 35 years? Is it our structure, meaning the Chapter concept that our Founder, Paul Hildebrand decided to institute when he started GWRRA? Or, is it the way we utilize Volunteers to manage our Association? Or, the fact that we "appoint" rather than "vote" for our volunteer Officers that have kept us around for 35 years? The concept being, the right person for the right job, not a popularity contest! Or, has it been our Benefits, Wing World, Educational Programs, like our Rider Ed and Leadership Training programs? Or, maybe the events we put on like Wing Ding and all the local Chapter, District and Regional events? Or, is it the corporate structure, leadership and solid business practices, as well as the focus on excellent Customer Service that comes from the Home Office, that has kept everything running for these many years? Or, does it have something to do with the type of people who ride Gold Wings and join GWRRA? Maybe, it is just a combination of all the above...or is it something else? I would like to hear from you, our Members, as to why you think we have been around so long. Even against all odds sometimes, and even in these tough economic times. AND, just as importantly, if you have suggestions on improvements on how to make sure GWRRA will be around for 35 more years, I want to hear those too! Send me your response here. I will publish some of your responses and summarize the others. Thank you in advance for helping us understand why GWRRA has remained so successful. I thank all the folks who continue to support our efforts and sent their articles...THANK YOU! You never know what is going to come from a simple act or what people are going to enjoy. A few years ago while attending the last Region N Rally to date, 2008 it was, my wife Angie & I were asked to join the Tennessee District Staff for dinner one evening. Having many friends in Tennessee, we gladly accepted. We met in Johnson City, Tennessee at a place called "Cootie Browns". It was a local place that had kind of an old gas station motif look to it. When we arrived we were ushered to a back room that was separated from the main part of the restaurant by a glass bay door. There were two long tables set up seating about 35 - 40 people. We sat at one of the tables that was Tennessee folks and the other table was occupied by Alabama folks. These two Districts were familiar with one another and as Alabama were the guests to Region N they were invited by Tennessee as well. As there were so many people there, you can imagine it took a while to get our dinners, and a room full of idle Goldwingers can be a dangerous thing! The details of the beginning are a little fuzzy, but someone started tossing little pieces of balled up straw paper at the drinks of one of the Alabama folks. This continued until it got boring, so a full scale napkin battle ensued. Throughout dinner there were waves of "attacks" with Tennessee launching a full scale attack on Alabama, and the Alabama folks regrouping and retaliating with a mass napkin attack of their own. Mind you we were in a shut off room, but in full view of the rest of the patrons because of the glass bay door. Several times you could see the jaws drop on some of the folks particularly the little ones. I remember one little boy walking up to the glass with mouth open in disbelief as to say "they are gonna be in so much trouble". We even threw napkins at one of the waitresses walking in the next room. She had an even more priceless look on her face when thirtysome napkins bounced off the glass next to her! After that the manager came into the room with a bottle of ketchup and chose the most innocent person in the room to squirt to try to calm things down, ME. Luckily the bottle was full of ice water not ketchup and the force of it knocked me out of my chair. At this point some of the Tennessee Staff were surprised we were still there, having thought for sure we would be kicked out. The dinner and all out napkin war continued for quite some time, but like all good things, this too had to end. It ended up with the waitress bringing a broom into the room for us to clean up after ourselves, which we gladly did. The napkin fight was declared a draw and all that were there had a great time, including the waitresses and the manager. I'm sure some of the other patrons talked about that night for quite some time, too. Chuck Caldwell was so distraught from the experience he promptly when back to the hotel and spilled his guts to Melissa Eason, who was the Executive Director at the time and was in attendance at the Rally. Before the end of the Rally, Ken & Julie Zahn, the Tennessee District Director, and Terry & Barbie Cleveland, the Alabama Couple of the Year, made a pact to meet on neutral ground and continue the battle. I'm pretty sure that Terry was the one who started this whole thing, even though he blames me. Anyone who knows me realizes I would never do anything like that. They set up the first of four and counting Tennessee - Alabama Burger Runs, which take place at the end of July, at Randys Restaurant, in Trenton, Georgia. This is located just south of Chattanooga, Tennessee on the Georgia - Alabama border. Each year both Districts meet at the restaurant and eat, kick tires and enjoy each others company. The first couple of years the restaurant supplied tons of napkins to continue the battle and even started closing for several hours just for the gathering. I call it a gathering, as there is no cost, nothing sold (except the food which they offer at a discounted rate) nothing advertised, no formal ceremonies or speeches, just folks getting together to have fun. They also sold commemorative tee shirts, but got away from that to preserve what it was intended to be, just folks getting together to have fun. The first one was just a couple of months after the Rally in 2008, and it it still going strong. Last year's attendance topped 300 and this year, even with bad storms in the area, there were over 200 there, mainly from Tennessee and Alabama but folks from Georgia and Virginia also joined in. This was the first year I was able to make the Burger Run, but even three years later, I was thrilled to be there. Most of the original folks from that fateful night in Johnson City were there, which gave me a chance to see them all in one place, and relive what started it all, a bunch of GWRRA Members getting together and having fun. Cootie Browns has long since closed but the spirit and memories that were made during the "Great Tennessee - Alabama Napkin Battle" that evening will live on for many years to come. I skirted Salt Lake City in favor of the back roads. I hoped I would find a nice camp site and camp two nights in one spot. This was suppose to be a trip of about 2/3 camping and 1/3 hotels. So far it has only been one night of camping. I ended up at beautiful Bear Lake near the border of WY, UT, and ID. I had been there with my mother and younger sister in the early 70's. I did not recognize it today. As a result of another festival there were no camping sites. I was determined to camp. I headed on to Montpelier, Idaho near the other side of the lake. Just outside Montpelier, I stayed at the best KOA I have ever visited. I have been at many and I had the best camp site there. The owner called my site an "overflow" site, not really a camp site. I had a mountain stream with trout on two sides of my tent where I stayed for two nights. The owners were fantastic. He had actually lived in the Dallas area for years. He used to go hiking in Wichita Mountains near Lawton, Oklahoma, my home for 30+ years. Small world! The first night I went into town to eat some fast food. I washed some clothes at the camp just in case I did not get another chance to do so later. Like gasoline in some of these parts: See gas, buy gas, see washing machine, use washing machine. The next morning I went into town to get something to eat and I saw a museum. I have many interests, history is one of them so, I had to go in and I was glad I did. It was a small museum about the history of the town and westward expansion. I arrived just in time to hear Nino Reyos play some of his flutes. He played the flute at the opening of the Salt Lake Olympic Games. I also heard him give a talk about the American Indian culture. I later visited with him one on one and, of course, I asked him to autograph a CD... for my wife; he was very personable. He seemed willing to talk to me all day; what a nice person. I learned more about Indian culture from him in that short time than in the 30+ years of living in Oklahoma. I got up somewhat early but took my time packing up. I wanted to stay but I wanted to feel the open road. For me, as with a lot of us motorcyclists, the journey is often better than the destination. I traveled north to the Tetons and Yellowstone where I spent two days. Yes, I finished off my beers the first night. Pictures and words cannot do Yellowstone justice. Since I had been there before I did not try to see it all. I never could anyway. Of course, Old Faithful was a must visit but the area was so crowded I did not stay long. I rode around the southwest part of the park traveling through Craig Pass at 8262', the highest pass on a main road in the park. Dunraven Pass is higher at 8878' but I believe it is a side loop. It is not unusual to encounter snow in these passes. I ran into some rain; I should have put on my rain suit but I figured my riding gear was somewhat water proof and I did not have far to go. I saw many deer and moose along this route. I then headed to Madison and Norris while still in the park. I was a bit damp and almost cold but the rain stopped so I warmed up. At Norris, I turned towards my cabin at Canyon. On my way out of town I bought a steak, a can of green beans and a potato to cook later in the day. I do not drink any alcohol when I am riding or on a trip where an early wake up call is required. Since it would be early when I cooked, I decided to buy some beer. I have a Polar Bear Ice Chest so I could take the left over to Yellowstone. Yes, I know, I'll have to control myself so there will be some left over and no hang over. I did control myself! I checked in and headed to the cabin. Just as I was approaching my cabin a large Elk was just hanging out behind it. What a sight! 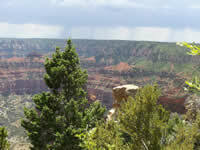 Canyon is by the Yellowstone River which runs through the bottom of the Grand Canyon of the Yellowstone. Beautiful! I spent most of my time in this area. I was shocked at how nice the lodging was. I had reserved it for the three of us, just in case my buddies could make it all the way. So I had plenty of room to throw my stuff. The location was almost perfect. After unloading everything, except my saddle bags, I was like a dog. I had to check out the perimeter. I just like to know where I am and take note of any other people in the area. Then I took a short ride, I could have walked, to get some food. I was as excited to be here as I was when I first rode my motorcycle away from the dealership. The first part of the trip was great with friends. This leg I did by myself, all alone! Only me to blame for a screw up! 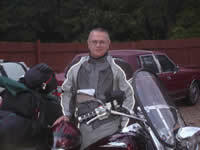 Here I am, sixty years old in Yellowstone National Park on a motorcycle. My road trip after a 26 year delay! Yes, I celebrated with some beer. Hey, I spent two years of college in Munich, Germany. Beer is one of their food groups. Besides, I did not have to be back to work for a week and I could sleep late. WHAT VOLUNTEERING CAN DO FOR YOU! When I volunteered for my first official ride as the lead I did not know what I had gotten myself into. I told Steve Fleming I would be happy to lead a ride he had planned but was unable to lead. After all, the ride was planned to Roundtop, Texas and I knew how to get to Roundtop because I have previously hosted many scrapbook weekend retreats in Roundtop. Boy, was I WRONG!!! Don't get me wrong, I did not take this challenge lightly, but I was sure I could pull it off. Steve already had the route planned and he assured me he would show me the way. Steve did just what he promised and sent me a wonder route to Roundtop. My husband, Ricky and I planned to drive the route on Saturday, so I would be familiar with the roads and turns, so the ride would be great for everyone. Well, that was just the beginning of the story. What was going to be a long, wonderful ride through beautiful 2-lane roads that we had never ridden before, would change in the blink of an eye. As the temperatures began to sore into the triple digits I had to make my first decision about the ride. I had to make the decision to continue with the planned ride, which would have us riding in the high temperatures for 6 to 8 hrs, or change to a shorter ride or cancel the ride. For the first time, I was faced with a decision that would disappoint one of my dearest friends and riding buddies because his ride, most likely would not happen. A few days before the ride I made the decision to change to a short breakfast ride. A suggestion was made to go to Elaine's, in Coldsprings, Texas, so the planning began. While I have lived in this area all my life I had no idea there were so many streets that would take us to Coldsprings. I scoped out the maps, got some ideas together and off Ricky and I went on Saturday afternoon to explore the roads and plan our final route. This adventure was also twofold as our oldest daughter and son-in-law have a Ranch in Coldsprings so we planned to surprise them with a visit. We chose to take my new Mustang so she would not feel left out, but actually it was just too hot to ride. We drove a few new roads I had not been on and felt the route would be short but good. We visited our daughter and family then headed back home a different route to make sure it was also okay for the ride home on Sunday. Sunday morning came and it was very hot, even at 8:00am, so I felt good about the decision I made. We had a fantastic turnout with 9 bikes, 1 car and 13 brave soles who were going to allow me to take them on our adventure. I lead group 1 with Suzanne Elrod as my drag, (go girls). Ricky lead group 2 with Michael Elrod as his drag. We traveled Hwy 59 to Splendora where we got off the highway and onto better roads. We traveled several 2-lane roads (don't ask the #'s) until we arrived in Cleveland where we made our turn onto Airport road. Ricky (keeping with the Thacker tradition) lead his group on a short scenic route so they could practice their turns, haha. We traveled the Airport road to Shephard, crossed under the freeway and headed to Coldsprings for our rendezvous with others that planned to meet us at Elaine's. Our oldest daughter and her family joined us so it was like a family reunion with both our family and our N2 family together. Mike, Nancy and their friend John also joined us. We were also honored to have the Chapter C Educators, Harold and Diane Deloach join us. Now our total soared to 22. The service at Elaine's was not as good as it had been in the past and they told us it was because we did not tell them we were coming. I reminded them that he had stopped in on Saturday and told them when we would be there and gave them an estimated number. Rex made up for the lack of service by filling our glasses and coffee cups when needed. Elaine's should have given Rex a free breakfast as he also provided refills for the other customers sitting around us. The stories were good and the company was even better as we waited for our food. When the food arrived, as usual the group got quiet. We finished our breakfast and said our goodbyes to the groups that met us there and off we went. The ride home was planned as a short ride as the temperatures were really climbing up. We all arrived home safely just as the temperature hit the triple digits. I was told everyone enjoyed the ride and they were glad I had made the decision to keep it short. I did have someone ask me if I could have found more stop signs, haha. Next time I will try to add a few more. Robin even saw a pig on a leash at one of the houses. You never know what you will see or do on our adventures. Now to explain the title: Be careful what you volunteer for, AS IT MAY BE THE BEST THING YOU HAVE EVER DONE!!! This was an adventure I will never forget. I now have more respect and admiration for our wonderful Ride Coordinators who take us on our adventures with PRIDE. It is not easy to plan a ride, remember all the turns (some have the benefit of GPS but we know about the GPS adventures), remember to announce your turns, point out traffic obstacles or road hazards and have fun. Our Ride coordinators do this every time we take to the road. They even plan for our comfort and safety by making sure we stop for fuel, take restroom stops and rest stops when the weather is not cooperating. Many times we do not say THANK YOU enough. I encourage everyone to VOLUNTEER AND GET INVOLVED in the numerous things your Chapter does. You will enjoy the challenges and knowledge you gain and this is what keeps us YOUNG AND ACTIVE so we can continue on our many adventures. Steve Fleming said something to me that puts the fun in volunteering, he said "if you are not having a good time then you forgot to pack it and bring it with you". Until we meet again, make everyday a new adventure. On our return to California from Wing Ding: Knoxville, coming through Cleveland, Mississippi, I commented to my bride, Marti, on her Trike, "These cross winds are making me work", as another gust occurred. However, the winds subsided for Marti but my bike continued to require a constant hold on the handlebars to maintain my path of travel. Just a quarter mile ahead we spotted a gas station and decided to pull in. Once off my bike, I soon discovered the "wind" was a front tire that was nearly flat with only 10 lbs of air. We checked the tire and found no nails or punctures. I hooked up my Slime Inflator and watched the tire pressure slowly climb to 20 then to 25 then back down to 10. The valve had sprung a leak. Marti gets into the Gold Book while I called AAA. AAA said that they would have a truck out to us in 30 to 45 minutes. So, Marti speaks to Jerry listed in the Gold Book, who was at work at the time and was only able to provide the name of a reliable tire repair shop in the next town 40 Miles down the road. Marti and I took shelter in the air-conditioned gas station and drank Frosty Freezes. I continued to monitor the area around our bikes and at a point thought our tow truck had arrived, so we went out in the heat but it was not our tow and he had no flat bed and was just pulling in for a rest. Then we decided to wait by our bikes when a man and a woman pulled up in a pickup, the woman looked at Marti and with the friendly grin said "Hey Marti". Marti was so embarrassed as she turned to and said, " I can't remember her name and where we met them". Marti turned and said," How are you doing"? Then the lady said, "I'm El Laurie and this is my husband, Doc Bolms. Jerry called us and told us that you had a flat and we thought maybe we could help. Marti gave a great sigh of relief and told El Laurie what she initially thought when she called Marti's name and we had a big laugh. Doc looked over the flat and agreed it was the valve stem and told us of tire shops, mentioning one just down the street but when we called they could not do a motorcycle tire. Then they told us to go to a dealership in Greenville about 40 miles from Cleveland and after a few minutes of conversation, Doc and El Laurie left. We waited about another 20 minutes when the flatbed tow truck pulled in and just as I was driving the bike up the ramp, Doc and El Laurie came back because they were concerned the tow did not have enough tie downs. It turned out that we needed three of Doc's tie downs to secure the bike. As we (Doc and I) were securing the bike, I asked Doc what Chapter he was in. 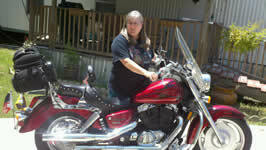 He said he didn't belong to a Chapter and that he rode a Harley and that Jerry and he were good friends. El Laurie said that Mississippi was a friendly and helpful state and was there to prove it! When the tow truck driver, Mr. Waltham, was at a loss as to the dealership location, El Laurie gave him all the landmarks and directions. As well, the shop was in the direction and on the same road we were traveling. While El Laurie was conversing with the driver she discovered that they had retired from the same school system. Knowing that, they decided to pick up the tie downs from Waltham's home the next day as the Bolms had some errands to do that day. We imparted our deep gratitude to the Bolms for their assistance and for coming back with the tie downs and headed down the road to the dealership, Greenville Motor Sports. Marti followed on her trike while I rode in the air-conditioned tow while learning the about the varied vegetation fields we passed on the 40 mile trip. When we arrived at the dealership we saw employees packing up and leaving while Mr. Waltham backed the tow up to the garage door. As I got out of the truck, one of the dealership staff handed me a large bottle of water then untied the bike, backed it off the tow and pulled it in the shop. I probably drank the whole bottle before they had the bike on the shop lift. In the mean time Marti had pulled up out in front, entered the sales entrance and was talking to the saleslady, Beverly Johnson, discovering she was the local Chapter Director. All the staff, Parts-Jeff Tarver, Service-Joey Rumley, Service Manager-Michael Dennis, all the people we needed to repair the valve stem stayed late to help us on our way. We again thanked all the staff and as we were pulling away we saw in our rearview mirrors, the staff getting in theirs cars and heading for home. While on the three day's riding heading back to California, there were no tire problems. Then, only four days after we got back, we got a call from Doc to make sure that we arrived home safely. Doc mentioned when he went to retrieve his tie downs that Mr. Waltham was shelling peas by hand. Doc told him that he had a pea-shelling machine which Doc promptly returned and delivered the next day. What great folks and friends we made that day; you can be sure if we ever head back that way we are sure to stop off in Greenville and Clarksdale to see some friends. GWRRA is proud to offer a brand new lightweight Riding Jacket with protection. GWRRA Logo on the front. GWRRA is embroidered on the upper back of the jacket. These jackets run about a size small. 1-Johnny Appleseed was real man named John Chapman. He was born 9/26/1774 and died 3/18/1845. He is buried in "Johnny Appleseed Park" in Fort Wayne.